Welcome back! I hope everyone enjoyed Grand Prix Charlotte (regardless of the technical difficulties the event experienced) and Grand Prix LA. I personally didn’t play in the main event, instead choosing to hang out in the Command Zone, play two-headed giant Sealed, and draft the day away. 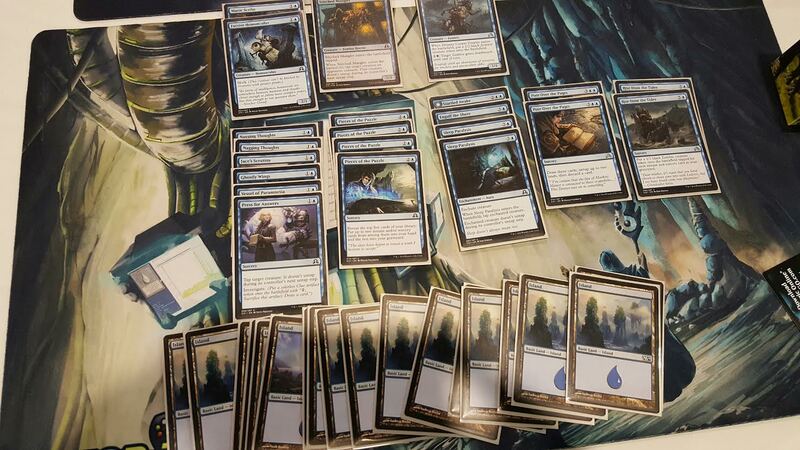 The highlights of my draft were this beauty, which would have 3-0’ed if not for some absolutely terrible whiffs on Pieces of the Puzzle and then flooding out in two games. Oh well. 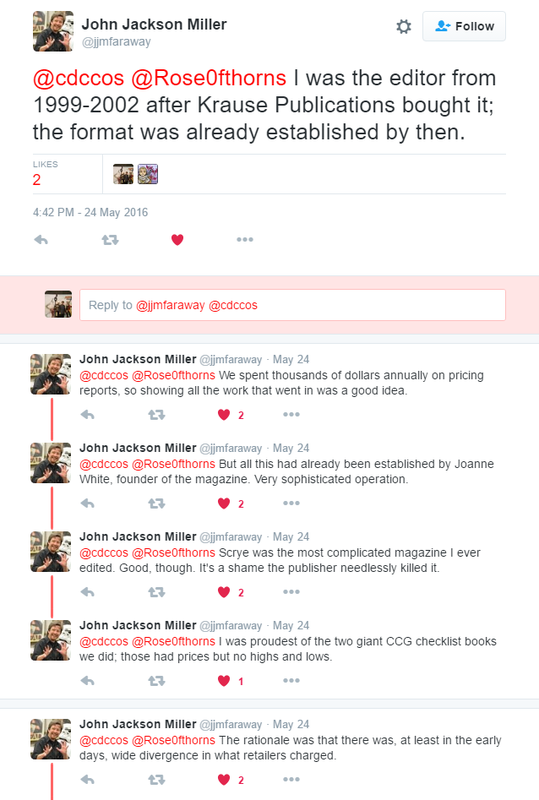 I also repeated my “Post pictures of vendor hotlists to Twitter”, but we’re not here to talk about that this week. In fact, we’re going to go off on a whole different topic that completely negates my statement last Thursday saying that we could continue in our Blueprinting adventures. Don’t worry, we’ll still be blueprinting and organizing 400,000 commons and uncommons this summer (yay……..), but I had a conversation with a friend of mine in the car during our 14 hour drive to Charlotte and I figured it would make for a great article. It’s really difficult to not know about “TCG mid” is nowadays. Most Android and Apple phone applications pull API from TCGplayer.com to make trading a simple and hopefully painless process for everyone. Some apps will also let you adjust the pricing metric that you use to “TCG low” or “TCG high”, or to manually adjust the price point to a number you and your trade partner agree upon. MTG Familiar is an app I enjoy using that also changes the color of the number to green when it’s been manually adjusted, to help prevent one party from swindling the other with some quick hands. But what is TCG mid, and how is it calculated? What’s the difference between TCG low mid and high, and where does each find its’ niche? Answering these questions is the main goal of this article. “TCG mid” used to be calculated as a mean average of the current available listings online. If for some reason there were only two listings on TCGplayer for Snapcaster Mage listed at $55 and $65, then the mid price would average out to be $60. That sounds reasonable at first, until we get outliers that skew the mean away from a realistic price point. If some random guy lists his Snapcasters at $85, then the mean is skewed pretty far away from $60. This is especially problematic when we consider new set releases and how long it sometimes takes for stores to reduce their prices, often due to forgetfulness or laziness. A couple of years ago, TCGplayer changed their “mid” to “median”. Instead of using the mean average of listings, the median number is taken from one single seller directly in the middle of the number line. 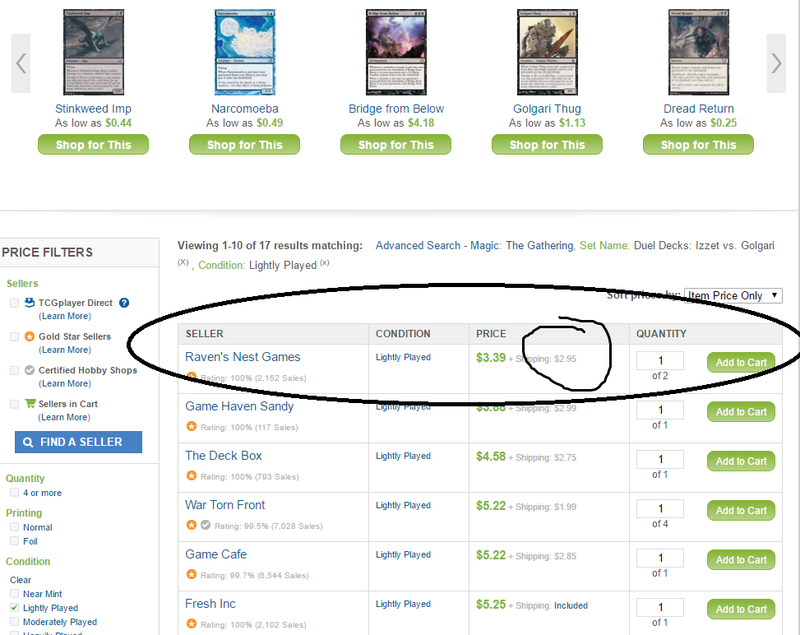 If there are two dozen sellers of Snapcaster Mage on TCGplayer and only the last five or six sellers forget to update their prices from when Snapcaster was $90, then the median price is safe from being skewed because the seller in the middle won’t be considered an outlier. Most of you probably use that number to trade Magic cards with each other, and that’s fine. As long as both parties are happy with the trading metric and don’t try to scam the other out of cards, everyone wins. Even if one person is “value trading” because they care more about buylist prices, the other person is still getting a card they want for their deck. If everyone who trades cards uses TCG median, then what’s the point of TCG low and TCG high? What do these numbers mean, and how are they calculated? If you freqent the Facebook buy/sell/trade groups that I’ve previously suggested in other articles, you’ve probably seen those groups use TCG low as a pricing metric, plus or minus a percentage. 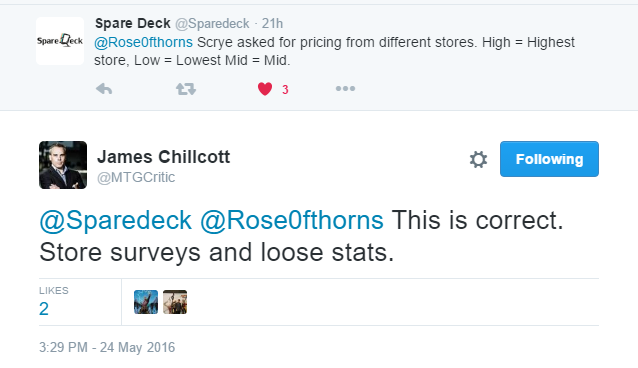 There’s no reason for grinders and players to buy cards from each other at full retail when other grinders and players would be more than happy to undercut SCG/Channelfireball and secure the sale, so TCG low is a more commonly used number to start from when conducting sales between two non-store parties. The number is generated by checking the lowest NM or LP listing on TCGplayer (without shipping). The fact that LP (lightly played) is included while MP/HP (moderately/heavily played) are excluded is very important here. If you’re a buyer who wants to pay 70% of TCG low on cards for your buylist and expect NM cards, you might be using the lightly played metric of a card for your NM buylist. Similarly, it’s hard for a seller to generalize and say that they’re selling an MP Underground Sea for a percentage of TCG low, without knowing what the difference between the cheapest MP and cheapest LP listing is. The second part of that definition is that shipping is excluded in the calculation of TCG low. While that ends up being close to negligible in the Underground Sea case where shipping will be $2-3 for a $250 card, it ends up being extremely relevant when dealing with $3-5 cards like Golgari Grave-Troll. 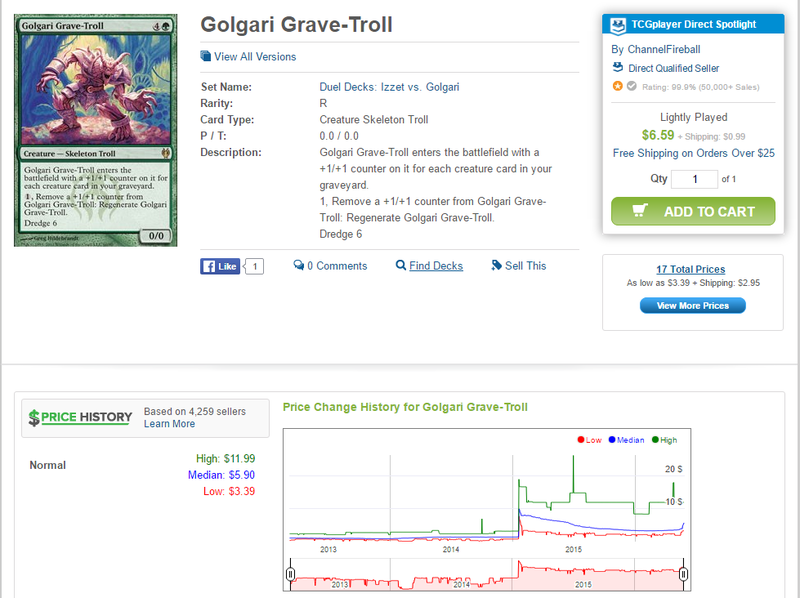 Looks like the TCG median of Grave-Troll from the duel deck is around $5. It’s crept up from the $3ish it was a few weeks ago, but it hasn’t spiked to a billion dollars. 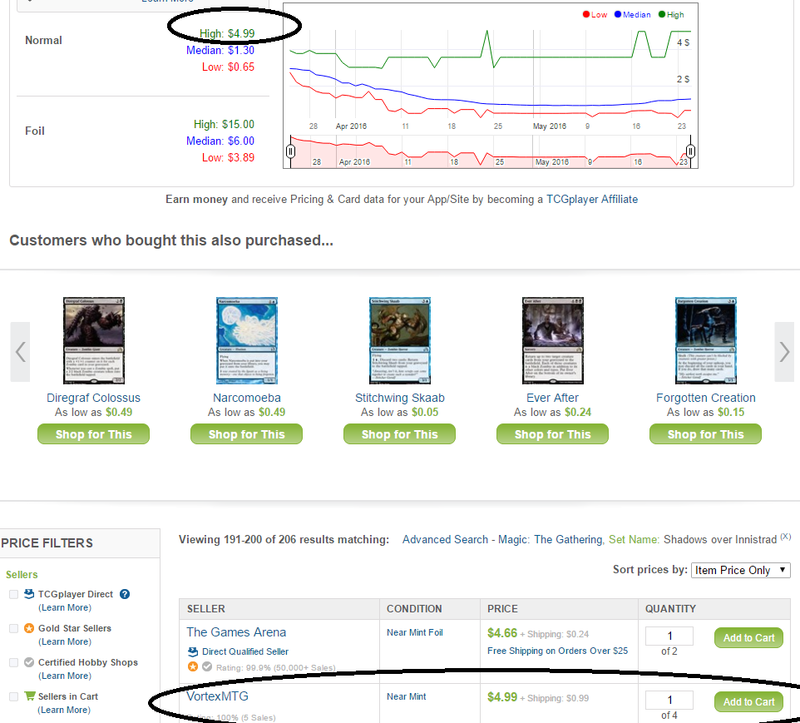 You want to buy into Modern Dredge with the help of the Facebook groups, so you decide to try and buy a set of Grave-Trolls for 10% less than “TCG low”. Sounds reasonable, right? The shipping is almost as much as the card itself! Even if you’re trying to grab LP copies on a budget, the “low” was calculated by looking at the “item price only” filter in the top right of the above picture, instead of “item price + shipping”. Most of the facebook groups that I’m involved with won’t take kindly to what they perceive as your “lowball” offer of close to $3, especially when changing that filter to item price + shipping shows us that the cheapest LP Duel Deck Grave-Troll can’t be purchased for less than $5.25. If you still want that set of Grave-Trolls, you’ll probably have to offer around $4.50 for each copy and be willing to take LP. That’s pretty interesting, considering how close it is to the median price. It also shows that any copies that have been listed closer to the visible “low” price are being snatched up, and that there’s real demand for the card. Now we get to the final metric, TCG high. As you may have guessed or already known, the “high” is measured by the highest ‘item only’, NM/LP listing for the card on TCGplayer without counting shipping. This number can often vary wildly, for the same reasons I stated that TCGplayer shifted from using a mean to a median calculation for their “average”. When a seller forgets to update their prices or neglects their inventory, we get relic prices from weeks or even months ago. Here we have the pricing information for Prized Amalgam, a $1 card from Shadows Over Innistrad. Cards from SOI (or whatever the most recent set is) are usually great examples of how skewed the TCG high price can be, simply due to the drastic price decrease most cards experience over a short period of time. Hell, Prized Amalgam only presold at $5 for a couple of minutes before dropping down to the $2 range in the weeks of release. Unfortunately, there’s still one seller who’s either very lazy or extremely hopeful that someone will stumble across his $5 (plus .99 shipping!) copy. I even had to scroll through over a dozen pages of listings just to find their copy, hidden among several foils. So… what’s the point of TCG high? Why would anybody use that as a metric for determining the value of their cards when low and median exist as options? Well, I had the same question until I got a phone call a few weeks ago. A player had gotten one of my business cards, and was looking to sell an Arlinn Kord they had opened from a booster pack. They said that they looked up the value of it online, and came to understand that it was worth $35. They would be happy accepting $20 because they knew I had to make money off it, and was wondering if I was available to meet up today. Before you ask, the card was not foil. After my initial confusion subsided, I quickly looked up the value of Arlinn. Did I miss something over the weekend? Had Arlinn skyrocketed to $35 when I wasn’t paying attention to Standard results? What could they possibly be using to get that number? Then I saw it; TCG high for Arlinn Kord was $35. I explained to the man that the number online was not an accurate representation of the true price point, and spent a few minutes teaching him the same thing I’ve been explaining to you in the past several paragraphs. Thankfully he was receptive and understanding, ending up selling me the Arlinn for $10 when I told him that the median price was $20 and that I would probably sell it for $16. While that story had a happy ending, I have to imagine that he’s not the only one out there using the high to try and figure out what his cards are worth. Other vendors or traders might not react as rationally to his misconceptions. With no real value being provided by TCGplayer listing the “high” price point, I got curious as to where the origin of the low/mid/high system came from, and used a little bit of #kiblergoogle to determine the source. So back in the old days, there was no SCG or TCGplayer to quickly check prices. If a card had a low of $2, a mid of $5, and a high of $7 in Scrye, you were less likely to trust that $5 number because you knew that it varied pretty widely. On the other hand, a spread of $2-$3-$4 was safer and you were confident in the $3 being a middle ground. The high had a relevancy, especially since prices weren’t so quick to change over the course of a single night or weekend. 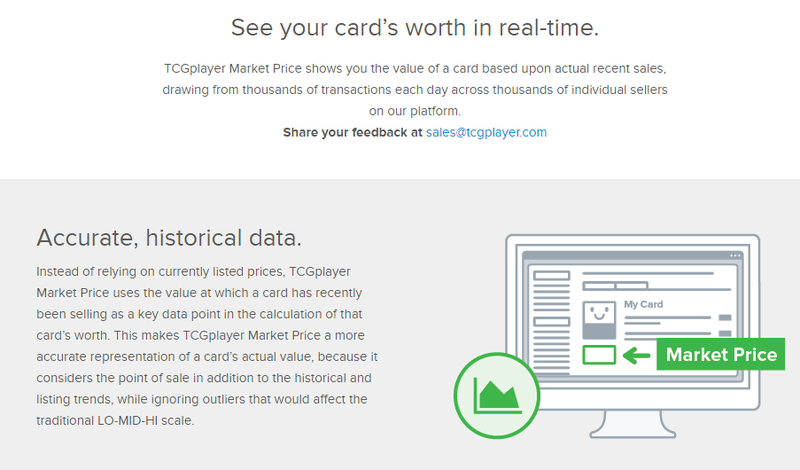 When TCGplayer opened their business as an aggregator of stores that could all grow their storefronts through a more visible marketplace, they ported over the system that Scrye had been using. 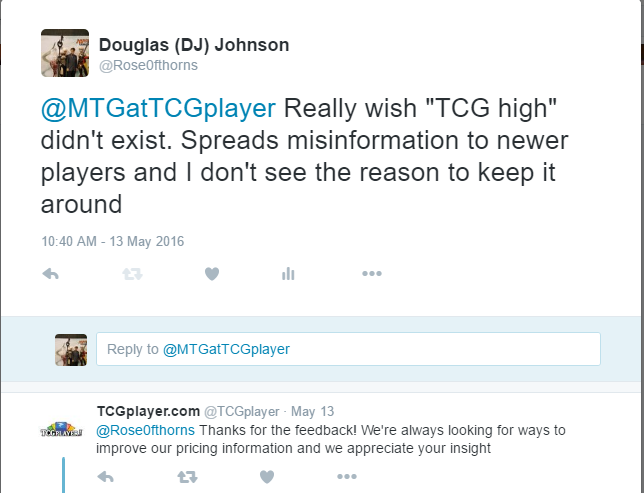 While that may have worked for several years in the past, I’d like to suggest that TCG high is no longer relevant towards market pricing today and actively misinforms some newer players as to what their cards are worth. In a world where cards can jump from $.25 to $10 overnight, the high metric only serves as a reminder of what a card used to be worth at some point in time. At worst, newer players could stumble across it and believe that their Arlinn Kord is worth twice the retail, or that their Prized Amalgam is worth $5 the true market price. 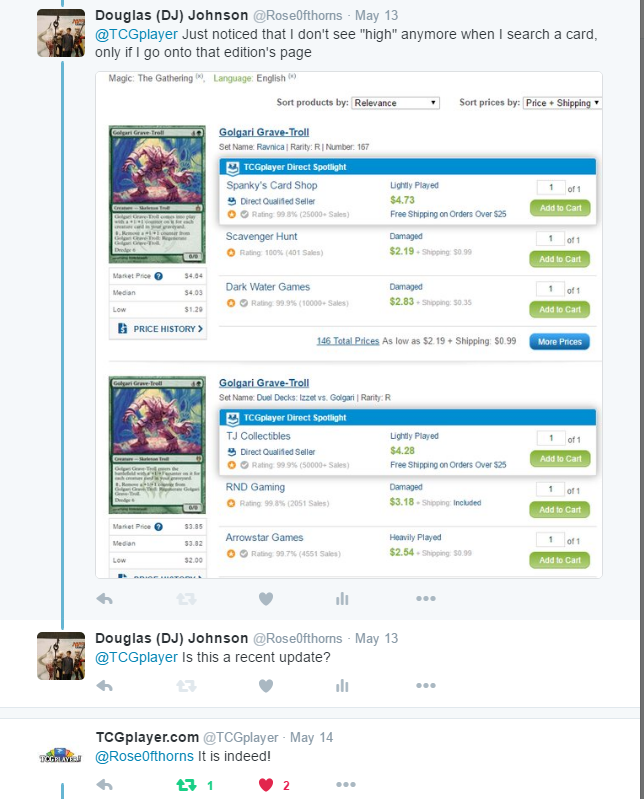 Thankfully, we also live in an age where I can tweet to the wonderful people at TCGplayer and let them know my feelings on the matter. I really appreciate that they were so receptive to my initial feedback, and that they were able to make a step towards eliminating TCG high from the pricing metric. I’m looking forward to them continuing to remove it from other areas of the site as we move forward, so that archaic sellers from two months ago aren’t cluttering up the real finance data that we all crave. You’ll also notice in that image that ‘high’ has been replaced with a different number, labeled “Market Price”. 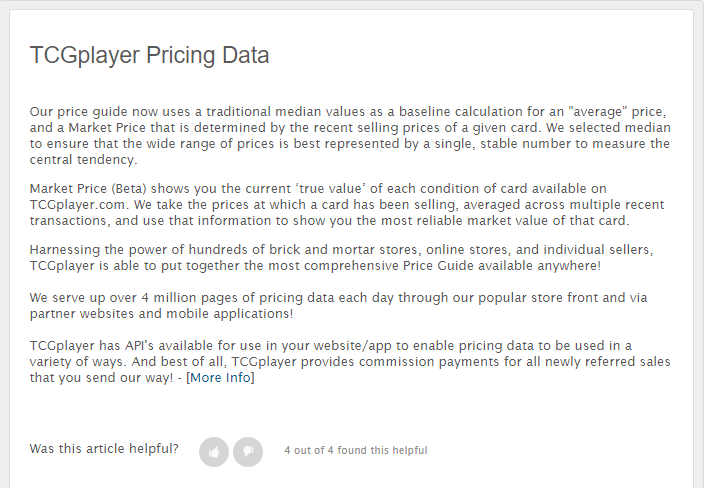 Instead of trying to give a complete description in my own words, I’ll let TCGplayer give you their definition of what this new pricing metric is, then try to elaborate on how it can help you avoid overpaying for something. So basically, market price will tell you what people have actually been paying for a card instead of what the card is currently being listed at. You might remember a few months ago when I suggested opening a TCGplayer seller account (which I still recommend doing), but for the purposes of checking the “last sold listing” measurement tool to gauge whether there was real demand for a card. Market price will be a less precise, more accessible addition to using that tool. So why add this in? What benefits does it provide that median and low do not? Well, it should do a decent job of showing the true value of a card immediately after a spike occurs. While there might be one seller of a card for $14 post-buyout, the market price will show what people are really paying for the card. If nobody adds their copies to the market to race to the bottom and the market price remains at the old number for an extended period of time, then its’ pretty clear that the single person who bought out the cards and relisted them for higher won’t be making any money, at least on TCGplayer. Market price will show that players are only paying the old price. As evidenced above, Shelldock’s market price hasn’t been running to match the current median price on the card. If we go another couple of days without data to suggest that Shelldock has been purchased consistently at the new price point, we can safely assume that it’ll go back down as more and more people race to the bottom and outnumber the demand sparked by the mill deck at GP Charlotte. Another human being paid actual dollar bills for Steamflogger Boss. Really? 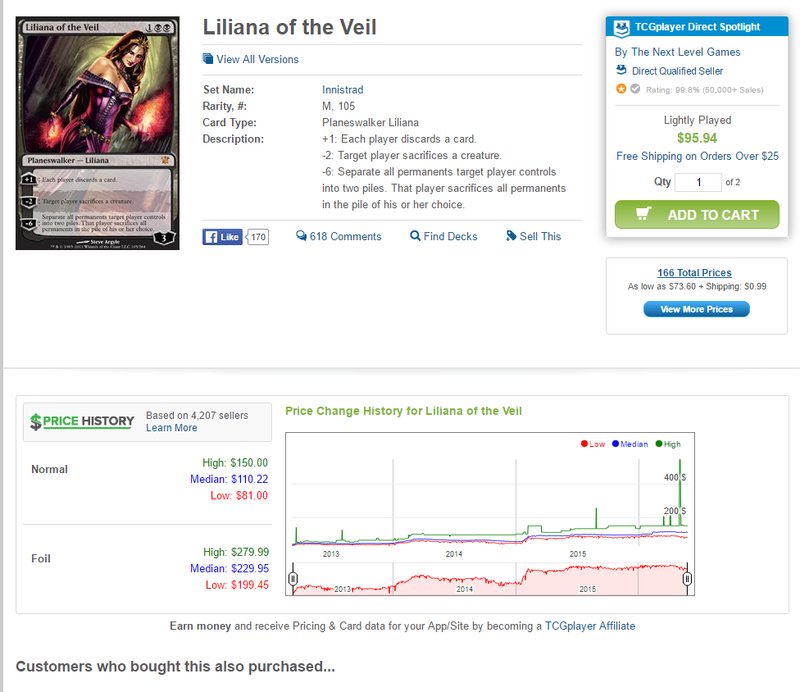 According to fellow writer Travis Allen, someone actually paid $5.99 when he checked the TCG last sold listing through his seller portal. I guess the demand from speculators is enough to continue pushing the card above $2, where those of us who own zero copies will get to laugh at those who bought out the internet. TCG’s pricing system is definitely solid, but it has some nuances that you need to look into before using their metrics as a blanket rule for your buying and selling. If you want to buy at “TCG low”, you need to specify per condition and whether or not shipping costs are taken into account. If you want to trade at “TCG mid”, you need to determine whether or not you’re talking about market price or median price. If you plan on buying collections, you can’t realistically throw out rules such as “50% of TCG mid”, because then you get screwed one way or the other when the spreads vary wildly on different cards. I promise that we’ll get to blueprinting in the next couple of weeks, but this topic was too good to pass up on. Until next time, and thanks for reading! ADVERTISEMENT: OzGuild makes organising your Magic card collection simple… Scan your cards into a digital catalogue using your smartphone, it’s fun, fast and easy. Scan in your first deck for free!